With the Year of the Kraken just around the corner, Hearthstone will be seeing plenty of big changes with the release of the Whispers of the Old Gods expansion, the introduction of Standard mode, and a number of nerfs being applied to older cards that are packing a bit too much punch. Sadly, there were no buffs announced for the various underpowered cards that exist. They also didn’t nerf Dr. Boom, the one card that needs to be nerfed more than any other regardless of the fact that he won’t be legal in Standard mode. 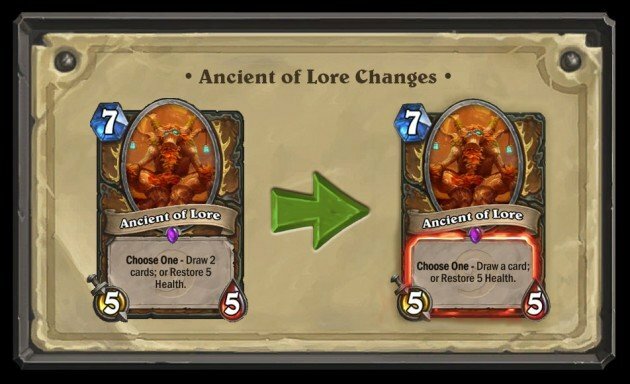 With that said, let’s go through all of the changes that are being made to numerous Classic and one Basic card and examine how these changes will effect Hearthstone‘s meta. Druid is getting hit the hardest with three staple cards being nerfed. First is Ancient of Lore, a card that has been a mandatory late-game minion for any Druid deck, losing half of its draw potential. He can only draw one card now, but he can still heal for as much with his alternate effect. That might sound like a small change, but it’s seriously going to cut into the Ancient’s usefulness as that card draw is entirely what made him so potent to begin with. While he’s not unusable in this new state, he’ll definitely be replaced with cards like Azure Drake and Nourish in a lot of builds. Try to pretend you didn’t see this one coming. Force of Nature and its insanely potent combo plays have dominanted the Druid meta since the beginning. No other decks besides Combo Druid have ever had a chance to enter the meta as their all immediately forced out by the one that tops them all. Combining this with Savage Roar is enough to slash through just shy of half of your opponent’s health even if your board is completely empty. Cast Innervate to enable a second Roar, and that’s more than two thirds of a player’s max health gone in a single turn. Obviously, something had to be done and Force of Nature has been almost entirely reworked. Now, the Treants it summons will just be simple 2/2 minions wih no special effect to them. 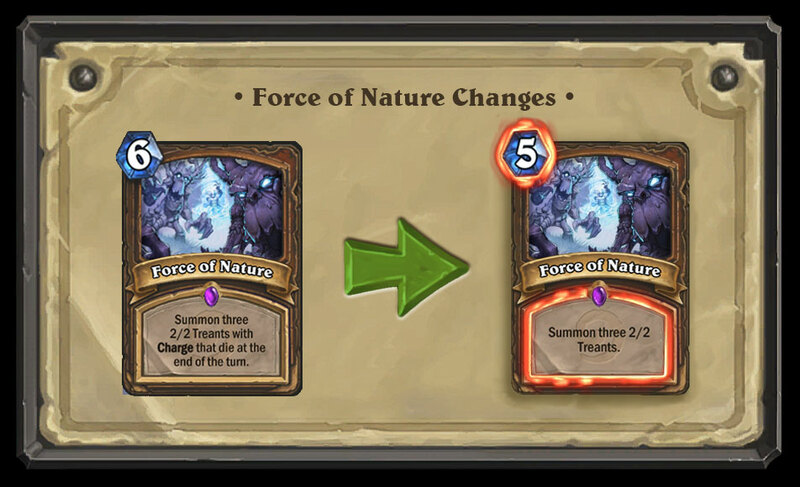 Combo Druid won’t be going away entirely, as Savage Roar is going by completely unchanged with this balance patch. It’s just that you’ll be able to see the combo coming from now on instead of your opponent seemingly pulling it out of thin air. Here’s one I never saw coming. 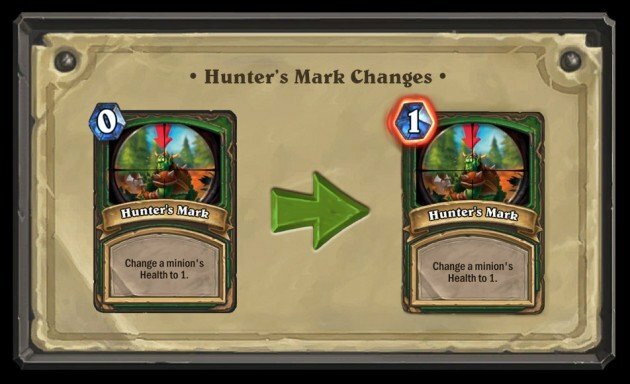 Hunter’s Mark, a card that sees little play to begin with, is having it’s mana cost increased from 0 to 1. 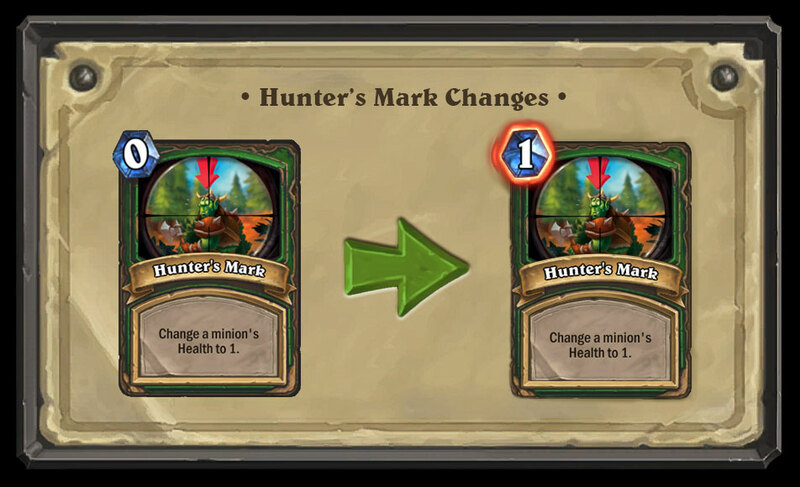 There are a couple of possible reasons for this change, first of which being a concern over Hunter having a 0 cost spell as well as Lock and Load, which is a pretty niche card anyway. The other possibility is this is a preemptive nerf being made with an expectation for Control Hunters to have a sudden rise in the new meta. 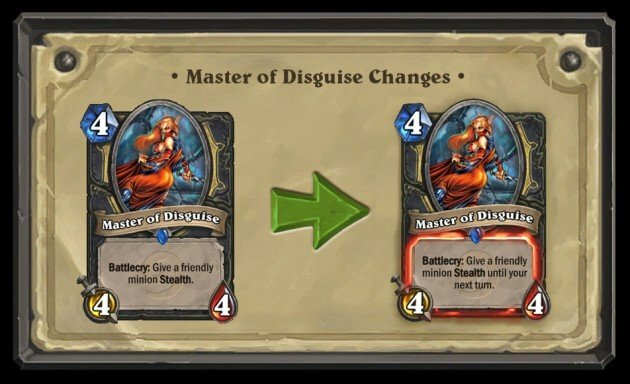 Maybe this will prove to be a vital change with the next expansion, maybe it was a waste of time. Here’s another nerf that seems more preemptive than anything else. Master of Disguise doesn’t see much play, but there is a great deal of potency when combined with the right cards. Casting stealth on Chromaggus, Troggzor, or Kel’Thuzad and letting them sit in the corner while their powerful effects go off forever can be massive. WotOG is bound to have even more fearsome options, so shutting down this potential exploit before it takes off is a smart move. It’s just a shame that Master of Disguise has missed the time in the spotlight before it even came to him (yeah, Master of Disguise is a male tauren, can’t you tell?). Blade Flurry and Tinker’s Sharpsword Oil came together for Rogue’s most potent combo. It seems a little strange to nerf Flurry this heavily as Sharpsword won’t be Standard legal. However, there is a bigger concern at hand with Flurry that made this change necessary. Flurry was an incredibly potent card and, as a result, Blizzard had to design new cards around it and be careful not to introduce overpowered combos. 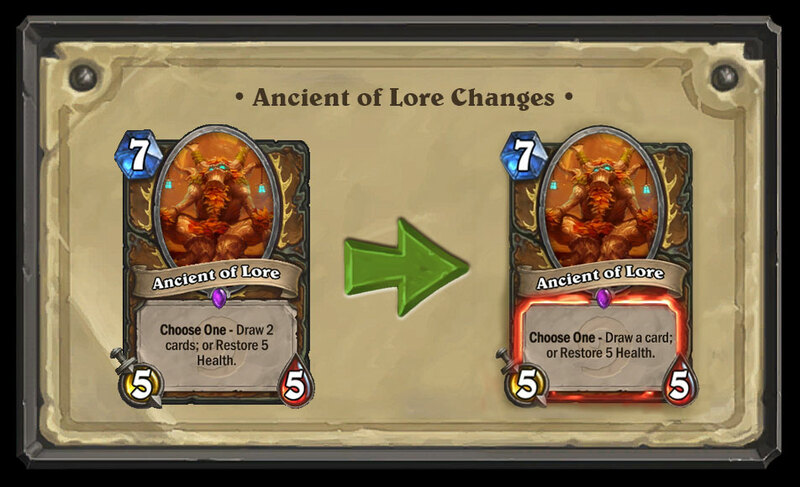 This change will open up greater possibilities in the future, but it has rendered Flurry almost unplayable. Maybe a new combo will arise at some point later on that makes it potent again, but it’s not going to see play anytime soon. Next to Force of Nature, this is the second biggest change the nerfs are making. 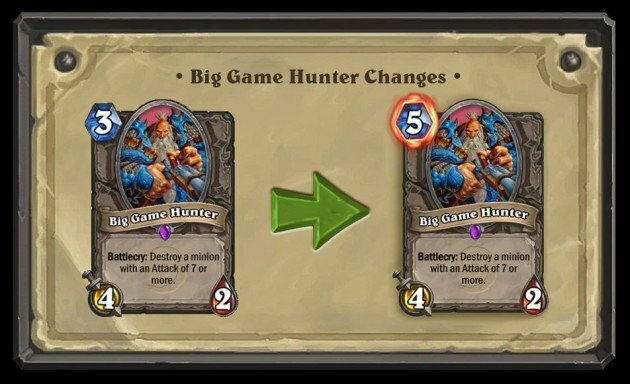 Big Game Hunter was probably the biggest tempo swing in the game, taking out the biggest minions in the game with ease while also putting a body on the board. Sure, 4/2 isn’t a great body, but the amount of control he gives you over the game makes him the best epic-level card in Hearthstone. There was a lot of talk in the community about nerf BGH as he makes most of the high cost minions unplayable. 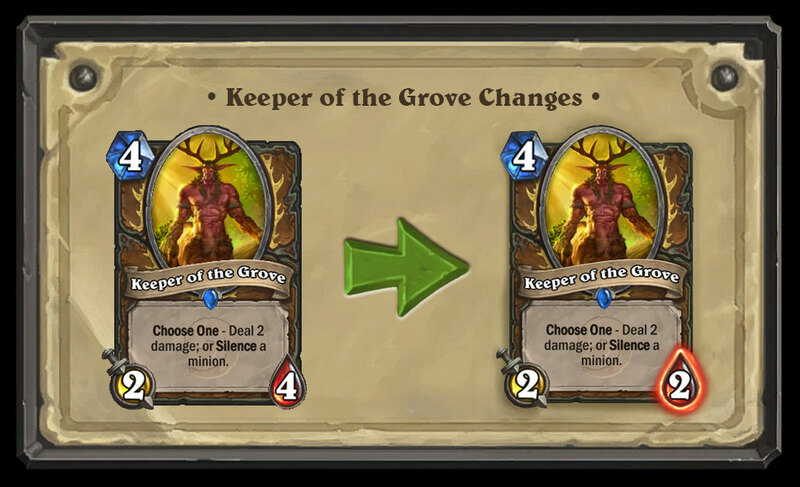 The increase in cost does help those cards enter the meta, but don’t expect BGH to completely die out. While several decks will drop him in favor of hard-removal spells like Polymorph and Shadow Word: Death, he’ll still be valuable to a few specific builds. Druid will still want to have BGH handy as that class has always had hard-removal as a weak point and BGH will still be its best option. Silence is one of the most powerful utility effects in the game and Ironbeak Owl has always been the go-to card for it in any deck. Have a taunt minion you need to get around to deal your lethal combo? Get the owl. Is there an enemy minion with a powerful effect that you can’t outright kill in time? Get the owl. Has your biggest minion been debuffed and rendered useless? Get the owl. Silence is incredibly useful, but it also restricts the meta pretty heavily as many cards can be rendered unplayable by its very existence. The increase in mana cost makes Ironbeak substantially worse as its stat line has gone from tolerable to horrid. It may still be worthwhile just for the silence effect, but trading it in for Spellbreaker. Knife Juggler has had the nerf hammer hanging over his head for the longest time and it’s finally hit. 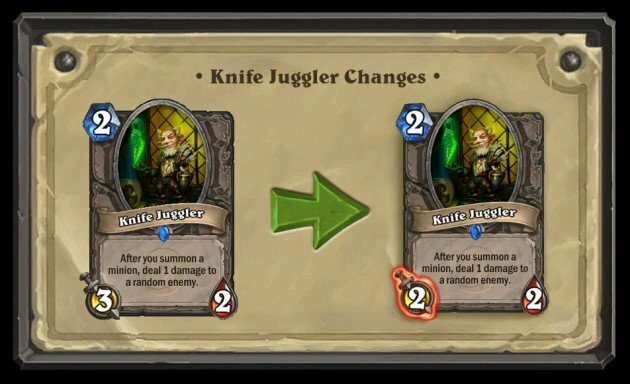 However, a reduction in attack isn’t going to discourage players from including him in their decks as it’s the knifes that really matter rather than the Juggler himself. Although random, the damage he can deal can strongly cement your control over the game and the premium stat line was just a great bonus on top of that. This nerf has simply made Knife Juggler one of the best 2 drops in the game rather than simply the best. Don’t disenchant you Jugglers as they’ll still be viable inclusions in plenty of decks. 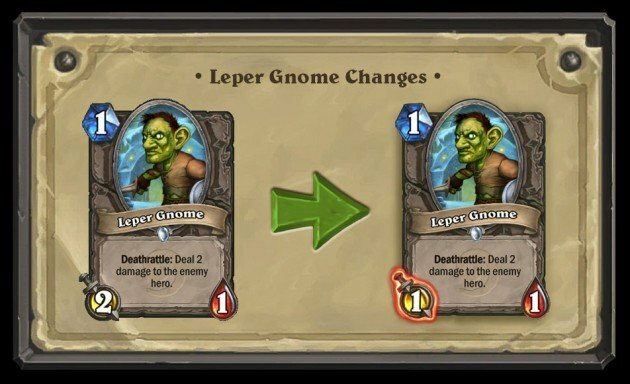 Leper Gnome and his horrific hugs have been center stage in every aggro deck to date, but this nerf may mark the end of a face-smashing era. With one less attack, not only will aggro decks have less punch to rush down the opponent, he also can’t trade up on the majority of 2 drops. This also indirectly nerfs Mekgineer Thermaplugg, but nobody had any plans for him to begin with. Leper Gnome may still have enough damage in him to be playable in aggro decks, but control definitely looks like the way to go with the upcoming meta shift. Oh, I am very happy about this one. Prior to these nerfs being announced, if there was one card I would have just removed from Hearthstone entirely, it was Arcane Golem. By design, it was a card that could only work in decks of pure aggression and going for the face from start to turn 5 lethal. 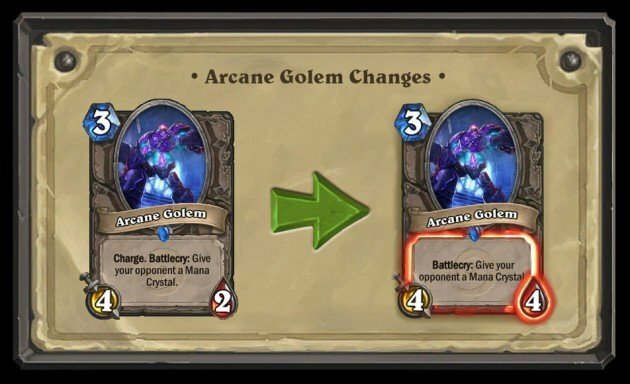 Well, this nerf basically has removed Arcane Golem from the game as it is now 100% useless. Dancing Swords and Ogre Brute only see occasional play in Arena at best and Arcane Golem is basically a substantially worse version of those cards. Giving your opponent a mana crystal is a huge disadvantage that will usually lose you the game. Golem was able to get away with it before because it was used in decks that killed the opponent so quickly that they never had a chance to use that bonus mana. A moderately cheap 4/4, on the other hand, is not that big of a deal. Good riddance to bad rubbish, I say. 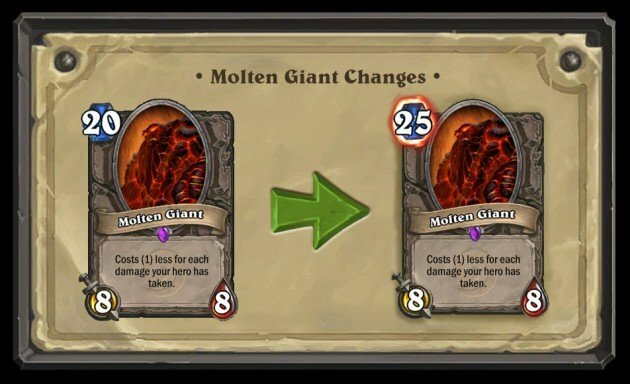 Molten Giant has always been the best giant for constructed play as it’s the easiest to play for free, even if you need to take some risks for it. Given the fact that players could summon two of these on the same turn for little to no mana and this nerf was warranted when its only threat, Big Game Hunter, is also taking a price hike. Granted, it’s still possible to play it for free, but you’re going to have to take a huge risk for it. One way or another, you’re going to have to pay the price to get this 8/8 on the board. This may lead some decks to swap in other giants in Molten’s place, but there also an interesting buff happening here. The Paladin spell Holy Wrath has always worked best with Molten Giant because of its massive cost (the spell even name-drops Molten in its flavor text) and this nerf actually makes the combination better. 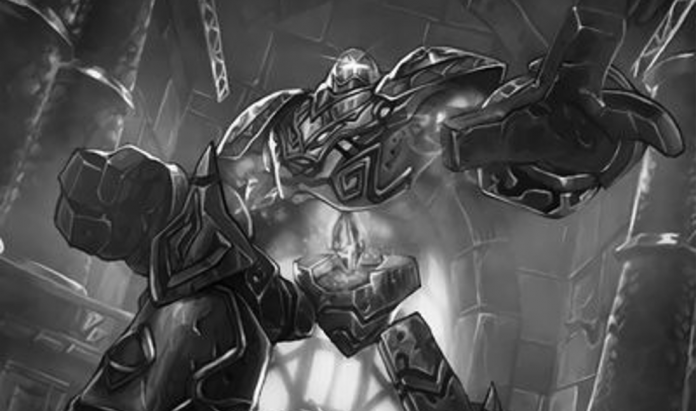 With all the high-cost minions being introduced with the next expansion and this change to Molten, Holy Wrath Paladin may actually go from a hilarious gimmick deck to a legitimate, high-level strategy. That does it for all of the nerfs that Hearthstone will be seeing in the next content update. It’s worth noting that Blizzard normally offers a full dust refund for disenchanting cards for a limited time after they’re nerfed, so hang onto your copies until that happens. 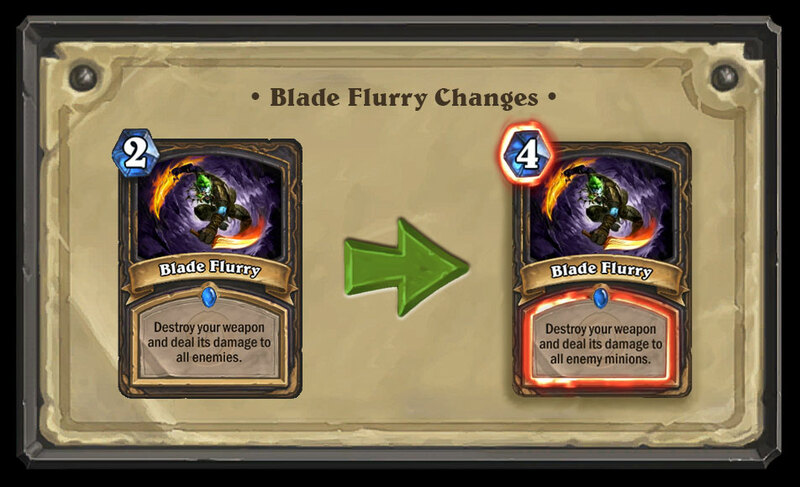 Once the nerf hammer drops, you should definitely burn Arcane Golem, Blade Flurry, and Force of Nature, but keep Knife Juggler. The rest will depend on what kinds of decks you’re planning to play with. Which cards are you glad to see go? Which are you sad to lose? Leave a comment below and let us know what you think. The Year of the Kraken begins on April 26th.